If your PC won’t start then you might try to recover the situation by booting from some other recovery environment: your Windows DVD, an antivirus disc, backup tool, whatever it might be. To try this out you must first install AOMEI PXE Boot Free on a central computer in your network. Point the program at your preferred ISO image, start its service, and that’s it: your preparations are complete. Now, if you need to start a computer from that environment, there’s no longer any need for DVDs or USB keys. Just switch the system to "Network boot" in the BIOS, and as long as it’s connected to the same network as the AOMEI PXE Boot Free computer, it should boot from your source image. Eventually, anyway (naturally it’ll take a few minutes longer than usual). AOMEI says the program doesn’t currently work with UEFI PCs. We’re not sure why, and didn’t test that specifically, but it’s a significant limitation. 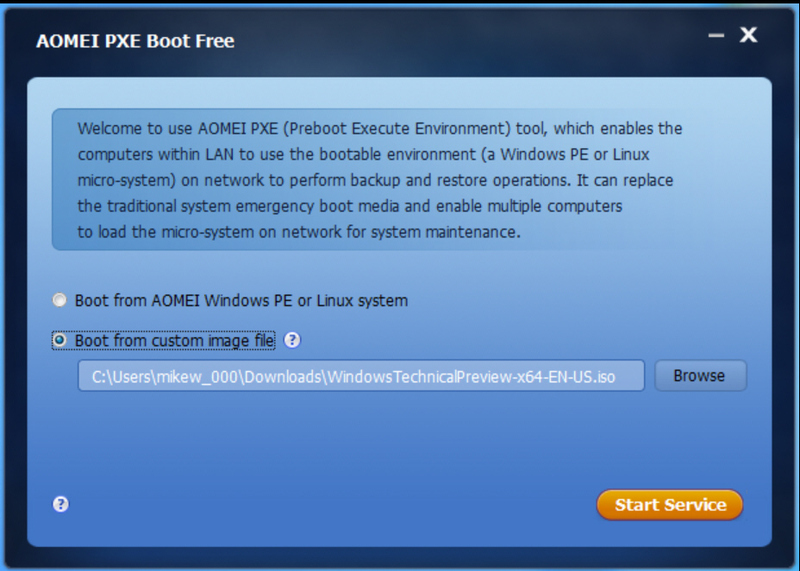 If you can live with that, AOMEI PXE Boot Free is a very straightforward tool, easy to use and with plenty of documentation to help you get it working properly.